Product Details: Can't decide on just one chili pepper? Why not buy them all? Just think of the possibilities! 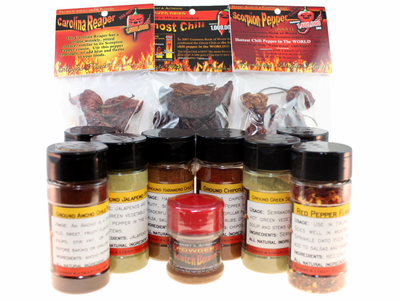 Save 15% when ordering the sampler pack versus ordering each pepper individually. The large, main image is what this sampler looks like without any upgrades. The smaller image illustrates what this sampler would look like with the cheapest upgrades possible taking out the whole, dried chili pepper pods. There are many combinations available and we aren't able to display them all.